I confess. I've not, yet, read the book. I've heard "Rust Belt" used a bit too much to market the book. I also fear the title "Hillbilly" could invoke stereotypes and cause a broad brush stroke on all of us in Ohio. But I liked the messages J.D. Vance, the author, has sent recently with his highly-visible return to his home state of Ohio. It's clear Elegy is the emphasis in the title. For one, he's a homesick Ohioan who took the first opportunity to return to his home state when his circumstances permitted it. At brief remarks he gave in Licking County Sunday night, he said he was hearing too many people where he lived in California who were disparaging Ohio to want to stay there. Secondly, he gives a message of upward mobility. His personal story is one of upward mobility, but it's also clear he intends to send a message for a wider audience with his personal story as example. He told a Licking County Republican Party audience on Sunday that the GOP should be "the party of working middle class people." 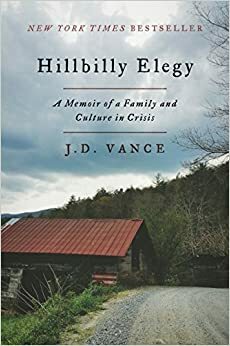 Perhaps, most of all, Vance is triggering an elegy for the phrases that have been used to disparage Ohio for decades. It's time we mourn the death of the Ohio pejoratives like "Fly Over Country" and "Rust Belt." Have you read "The Hard Way on Purpose: Essays and Dispatches from the Rust Belt" by David Giffles?